The Centre for Ephemera Studies (CES) joined forces with the John Johnson Collection of Ephemera on Wednesday 1 November 2017 for a workshop on Ephemera and Fine Art. It was held in the Weston Library, hosted by Julie Anne Lambert, Curator of the John Johnson Collection. The aim of the day was to explore ways in which history of art and ephemera are linked through various collections and research topics. The first talks explored the advertising and fine arts and how fine art prints found their way into the Victorian homes, through lotteries, advertising and collectable cards. Examples from Pear’s soap and Hennessy cognac in the John Johnson collection stimulated discussion. Questions were raised about who selected or commissioned the artwork, production costs and whether this commercial use of art was in any way philanthropic. The second session was about the use of fine art and artists for commercial branding looking closely at the Pear’s and Sunlight soap adverts, particularly their use of Millais’ Bubbles and Frith’s New Frock. These artworks were used and edited many times, which raised some interesting questions around copyright at the time. History of Art student Madeleine McCarthy gave a presentation on research she had undertaken on a small Docteur Pierre advert she selected from the John Johnson Collection. The small advert is a scaled down version of a poster designed by Maurice Pillard Verneuil, a copy of which is held at the Bibliothèque Nationale de France. Madeline discovered that the advert was quite unusual for a number of reasons. First, Verneuil is better known for pattern design oppose to posters, and secondly, that the poster was produced by chromotypography, an uncommon printing process. Furthermore, the poster is an early example of a commercial company commissioning an artist to design an advertising poster. Michael Twyman and Claire O’Mahoney considered the varied work of Jules Chéret including public building murals, Rimmel adverts and sheet music covers, and discussed why Chéret had such a varied career and his relationship with his commissioners. Michael Twyman presented the evolution of private view cards, using examples from the John Johnson Collection. He began with typical nineteenth-century letterpress handbills for single work exhibitions, then invitations designed by featured artists, followed by the use of halftone photographic images. He concluded by looking at invitations produced as part of museums’ and galleries’ branding. Nicholas Knowles shared his research of medley prints for screens and albums, produced by Ackerman and Rowlandson. Questions were raised about the high retail cost of these cut-out images, the rarity of finding un-cut sheets and how the images have been inspired and influenced by previous works of art. 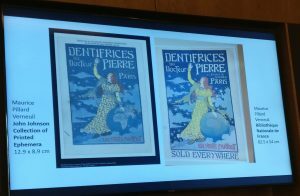 The day concluded with a look at Michael Twyman’s collection of Mourlot exhibition posters, and discussion of the skill of the lithographer and the accuracy of the reproduction of artists’ work for the advertisement of exhibitions. The workshop is one of a series of events to celebrate 25 years of ephemera studies through the work of CES, and its collaboration with the John Johnson Collection. The next event is an open afternoon on Wednesday 15 November 2017 on the theme ‘Dialogue and interaction in business and commerce: forms, invoices, correspondence, trade cards’. This will be held in the Typography Department, University of Reading, from 2.00 to 4.00 pm.